A few tidbits of information from V-Jump. 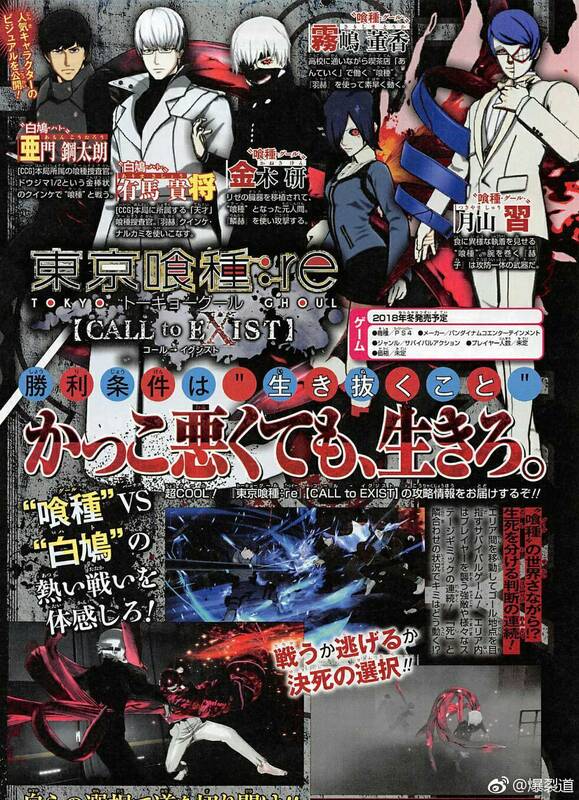 The latest issue of V-Jump has a new details on Tokyo Ghoul: re Call to Exist. First off, it has a look at the in-game character models for Koutarou Amon, Kishou Arima, Ken Kaneki, Touka Kirishima, and Shuu Tsukiyama. The game was previously confirmed to feature characters from across the franchise, including Tokyo Ghoul, Toyko Ghoul √A, and Tokyo Ghoul: re. Next, it has the first few system details. Tokyo Ghoul: re Call to Exist is a survival game where players move between areas to reach the goal point on the map. Areas are filled with strong enemies that attack players and various stage gimmicks to overcome. Whether you fight or run away is your decision, and your decisions will open the path forward. Tokyo Ghoul: re Call to Exist is due out for PlayStation 4 this winter in Japan. It is also planned for release on PlayStation 4 and PC in the Americas and Europe, but a release window has yet to be announced.